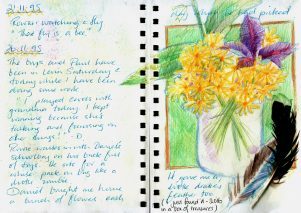 Kimbra’s blog about mindfulness and online art course. Widen the view and tips on how to draw eyes. Tomtits!! Enough, I’ve had enough, I’m not painting another tomtit…thank-you, wise counsel. 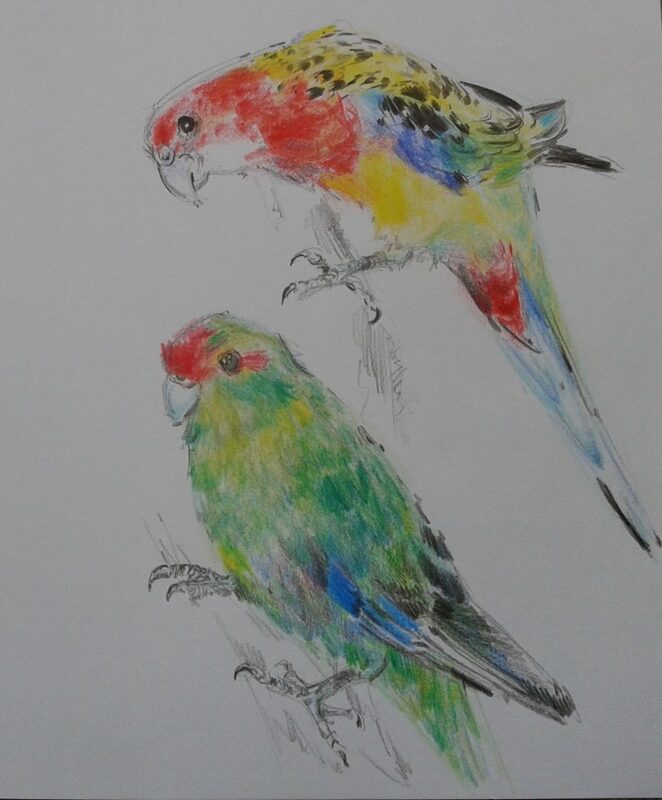 I search out another bird…hmmmm…I like that Kaka, I can paint Kakas. T h i r t e e n Kakas later…Kaaarrrrggghhh kaarrrgghhh. I still can’t paint feathers!! Why didn’t I follow the advice of the voice in my head and give up??? It can take time to find out what you like and you try things out and give them up, but art is a constant for me, I could have given up many times but I haven’t. 2.96 It’s very humid, my three year old son has stripped to his waist. I go outside, where a wind is whipping up and he follows me, “don’t get cold,” “no, I can take off the cold.” “How?” “I pick it off.” He plucks at his little chest. Art knocks, on the inside of my ribcage…hey, let me out, let me out…ratatattat… So I let it out and I fall in love. I do, I fall in love with aspects of life when I paint and draw; a tiny bell in a Spanish church, tracings of lace on a dead leaf…the hues on a child’s face. 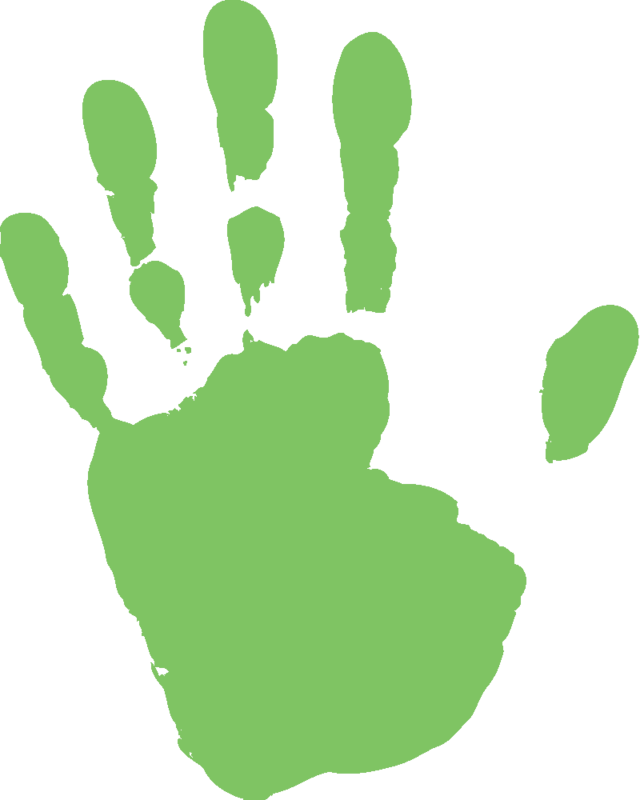 Our capacity to love, feel empathy and draw/paint are right hemispheric; all about the other. Drawing eyes begins with acknowledging our left hemispheric symbol. 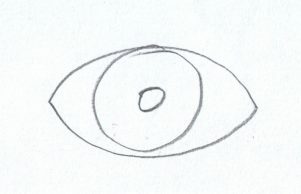 In the symbol, the eye is symmetrical and the iris and pupil fill the eye shape. When we see a real eye, we notice that it is not symmetrical. In the average eye, the highest point of the upper eye, where eyelid and eyeball meet is one third the length, not the middle. The lowest point of the eye, where the lower lid meets the eyeball, is two thirds the way along. This assymmetry is related to the muscles of the eyelids. The left hemisphere knows that an eyeball sitting in an eye socket is round and the iris sits in the middle of the ball. This is a fact but eyelids create assymmetrical form and every eye has it’s own unique set of spatial relationships. This can be seen by the right hemisphere, which is aware of connections and relationships. We can sight using horizontal and vertical lines. In a relaxed eye, the upper lid covers the top portion of the iris, so the pupil is positioned in the upper third of the visible iris. The inner canthus is curved and lower than the outer canthus which is pointed, we can sight this using a horizontal. 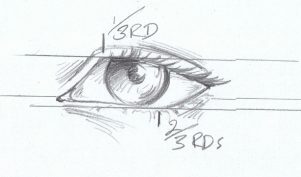 Knowing how the eye is structured makes it much easier to draw! When we draw in this way i.e. aiming for accuracy because we want a representational drawing, the two hemispheres are communicating with a common purpose. The left evaluating and applying what it knows, the right perceiving and recording the visual information moment by moment. This harmonious state is powerful but fragile because it is prone to the interruptions of the left hemisphere, in it’s attempts to keep you “safe.” “That’s a dumb drawing…I can’t draw.” One might be killed in a drawing attack, or worse…fail. Failure is just another word to describe our encounters during the learning process.